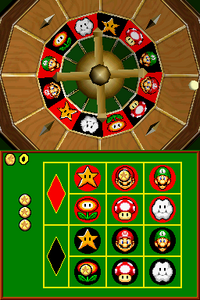 Mushroom Roulette is one of Luigi's minigames in Super Mario 64 DS. It is a luck-based casino game that has simple rules. Its name is a pun on the unrelated game of chance, "Russian Roulette". The player starts with ten coins and must place a maximum of five coins on their cards (each card has a different picture). Luigi then rolls a ball into the roulette. There are many slots in which the ball can roll in. Just like on the player's card, there are pictures in each slot. If the ball rolls into a slot that matches the picture that the player put coin(s) on, the player is rewarded with the amount of coins they placed on the picture multiplied by twelve. The player also can put a coin in the lines in between two or four pictures, or on the red or black sections, to get a higher chance to win. However, the player is not rewarded with as many coins. The game ends when the player runs out of coins. If the player quits before running out of coins, then their current amount will be saved. Guess where the ball will land on the roulette wheel. Guess correctly to win coins! The music played during gameplay is the casino theme in Super Mario Sunshine, except the trumpets and whistles are missing. This page was last edited on April 3, 2019, at 09:10.